I have a special interest in antenatal and post natal osteopathic care and have been working in this field for 25 years. During that time I have been a lot of new mothers and more often than not, at some point during the first year of their child’s life, treated them for what I know as Mother’s shoulder. I have also seen fathers with the same complaint , so maybe it should be called parent’s shoulder? Typically they complain of pain under the shoulder blade and in the base of the neck, sometimes with pain further up the neck and / or into the upper arm. If it is very bad they can get pins and needles and / or numbness into the arm as far as the fingers, or if it is the neck, they can get bad headaches. It is usually on the side opposite their dominant hand and come on gradually and continues to worsen. It usually takes the form of a dull ache under the shoulder blade, like a tooth ache, and nothing really seems to shift it. Massage can help for a while but the pain returns. Often I hear of people pushing their mid-backs up against door frames to try and self-massage the knot of muscle that builds up by their shoulder blade. After ruling out anything more serious, very often what is left is a musculo-skeletal strain pattern that I know as Mother’s Shoulder. This involve a jamming of the joints between the ribs and the spine and the resulting muscle spasm that builds causes all the symptoms. This can be very painful and cause nerves to get squeezed (thus the pins and needles / numbness that can occur). I have found that until the mechanics of the ribs are corrected the pattern will continue, and this is where I, as an osteopath, can help. Patients have often reported great improvements soon after treatment. a) the mother’s body is having to adapt to not being pregnant any more. All those postural changes during pregnancy have to be “undone” and the body has to re-organise, and all of this whilst raising a child. b) parents tend to carry their child over the shoulder of their less dominant hand so that their dominant hand is free (to write, use keys etc etc). and c) the most important factor is what parents do when they feed their child. They sits down to feed, get themselves and their baby nicely positioned using pillows and alike and starts to feed. All is well but then they, as we all would do, looks down lovingly at the bundle of joy in their arms.They spend the whole feed doing this but in doing so they places a postural and mechanical strain into their neck and shoulder. I tend to find this is more of an issue in mothers that bottle feed, especially if the bottle is used at night. The reason for this is mothers that bottle feed tend to feed on the same side which means they strain the same side of the neck and shoulder each time. Breast feeding mothers have to alternate breasts so don’t place so much strain on any one side. The other thing about the night feeds is that due to tiredness you are more likely to let your head hang heavy, and this placves further strain into the neck. It is this, along with the increased lifting and carrying that the mother does that kicks off this pattern. Bear in mind that all of this is happening at a time when the mothers ligaments are still soft as a result of the hormones in her body from when she was pregnant. This is especially the case for breast-feeding mothers as the ligaments stay softer for longer. If the ligaments are softer then the muscles have to work harder to support the joints, and this can exacerbate problems like this. Don’t get me wrong, I am not saying don’t look at your beautiful child, I am saying be aware of your posture when you do this and do some gentle shoulder rolls and stretches. Flexibility is important, keeping the mid-back and shoulders mobile with greatly reduce the likelihood of this complaint. Find a mother and baby yoga class to go to as here you will learn fun and safe techniques that will keep you moving, and be great for you baby as well. If you start to suffer then some osteopathic treatment may well help. If you would like to see an Osteopath then please consult http://www.findanosteopath.co.uk/ to find your local Registered Osteopath. In treating complaints like this it is often a case of helping manage the situation. Parents can’t stop being parents, so it is a case of offering treatment for the mechanical factors whilst advising on “lifestyle” changes that reduce the chance of it happening again. If you have any questions about this, please do feel free to contact me using the form below. However, please note that this article describes a pattern I often see, but that this may not be what you a suffering from if you have these or similar symptoms. Please seek an appropriate medical opinion rather than consider this article definitive advice as there are other reasons why you could be suffering these symptoms and these will need to be ruled out. After providing antenatal care the team at Chelsea Natural Health strive to continue to provide help and support to postnatal mothers, their babies and the rest of the family. For instance, Cranial Osteopathy with Philip Waldman can be very helpful in helping both mother and baby overcome the stresses and strains of birth and acupuncture with Eva or Alexandra can help resolve constitutional issues, as can Shiatsu with Jan.. Massage is wonderful for everyone, especially mother and baby, and all of our massage therapists have a special interest in ante and postnatal care. 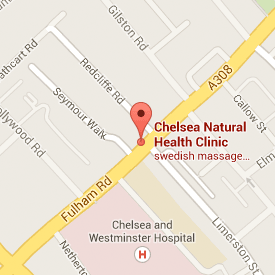 These are just some example of the treatments and care on offer at Chelsea Natural Health.